Bare Island jutts out dramatically from the mainland and is accessible on foot from a long wooden walkway. The right side of the island is protected and good for diving even when the sea is rough. Multiple dive sites exist around the island making it a place that you can keep coming back to. If you dive the right side you will initially drop down to about 15 metres and cross over a small reef. If you turn left and head southwest you will cross a sandy bottom and wind up at the main reef. 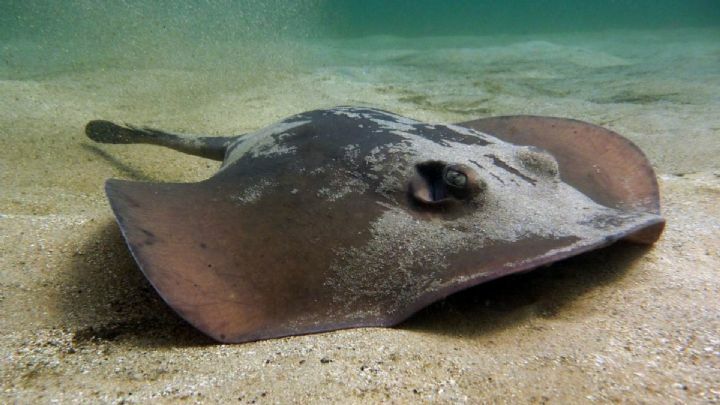 Flatheads, numbrays, rays and flounder can be seen half buried in the sand so be careful if you touch the bottom. There is a gutter that you can swim through between rocks and kelp near the reef. The marine life on the reef can be very plentiful. Noteworthy are the pygmy seahorses and weedy sea dragons one can see here. There are also several kinds of sharks that can be seen here, namely grey nurse sharks, port jackson and the occasional dusky whaler. At about 20 metres is a low overhang around which a lot of sea life exists. There are catfish, Sydney cardinalfish, yellow-banded sea perch, and half-banded perch. On your way to this cave are colorful sponges, giant ascidians, lace coral, Bairds solitary coral, and sea tulips. Camp Cove is an easy shore dive that PRO DIVE goes to from our store in Coogee. You enter from the beach and can go down to a maximum depth of 8 metres. Once in the water head northeast along the wall and you will encounter several swim-throughs and nice overhangs. If you swim further west you will find a small reef. You can find octopus, cuttlefish, seahorses and many other fish around the reef and the wall. One final important consideration is that there are lots of boats in this area that may be unaware of the presence of divers. Thus, always look up and lead with a hand when you are ascending. 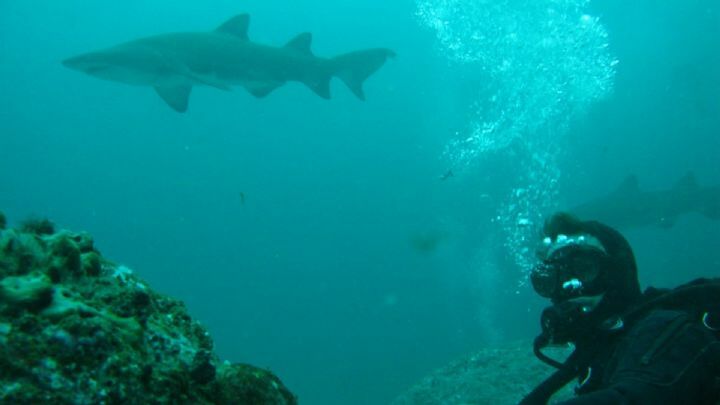 Gordons Bay is located North of Coogee and offers easy diving in calm conditions, with a maximum depth of 14 meters. This site is especially suitable for novice divers and night Dives. Entry into the dive is directly from the carpark, just follow the path down into the water. One of the unique features is the nature trail, defined by a chain which you can follow around the site (note the chain can disappear under the sand at some points) . The trail is approximately 600ms and the dive itself will take on average 30-40 minutes. Features include a small wall imaginatively named "The Wall" and is considered the most interesting part of the dive. Gordons Bay is protected by a reef called the 'Bommie". You will find Sydney's usual suspects on this dive, Blue Groper, Sting Rays, Wrasse , Nudibranchs ,Goat Fish and Port Jackson in winter. With a variety of dive sites on offer, we can cater for beginnners, veterens and everyone in between! 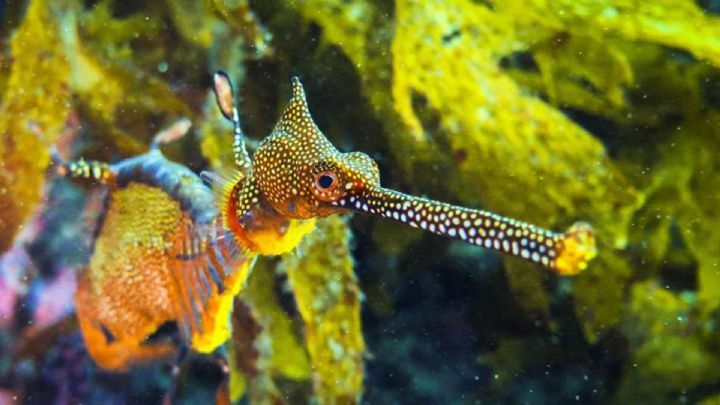 .This area offers some of the most interesting and diverse marine life in Sydney including the beautiful Weedy Sea Dragon! The best site will be selected on the day by one of our experienced Divemasters/Instructors and is determined by a number of factors including swell, tides and experience of the group. The entry and exit point for this dive are both in the same spot (unless you do it as a drift dive). It's a little channel between the rocks right in front of the flagpole. It is one of the easiest entries in that you can sit on the rocks to put your fins on and in all but the most severe conditions, as there are no waves. The Monument is a very easy dive site, with the relatively longer surface swim being the hardest part. Due to its location right in the bay, visibility can be a little worse here than the other sites around Kurnell. Overall however, it is still a very nice relaxing dive with usually lots to see. Once you enter the water, snorkel out over kelp in a north easterly direction. There is a red navigation marker out in the bay and if you head towards it you are going in the right direction. Once you become sick of snorkelling you can descend as sometimes large rays are seen swimming over the kelp. At this point you will be in about 4 mt of water so continue to follow your compass until you come to a drop off. Drop over the wall for the main part of the dive. If visibility is poor the top of the wall also makes an interesting dive. Swim along with the wall on your right. The Monument is a great dive to take a torch, as there are numerous overhangs where you could see anything from large Cuttlefish to Blue Devils, Wobbegongs and even the occasional Banded Coral Shrimp. After entering the water, swim towards Bare Island for about 20 metres. Descend here amongst the large boulders and make your way down to the sand at around 10 metres. Follow the sand edge to the east and the water gradually gets deeper to about 15 metres. When looking at the sponge covered rocks, have a closer look and you will notice a large variety of different species of nudibranchs. The rocks are also home to numerous other species including Blue Throated Ascidians, Lace Coral, Sea Fans, Tube Worms and Sea Squirts. Many of the rocks are covered with a redish weed. If you look very carefully at this weed, you may even discover a pygmy pipe horse. 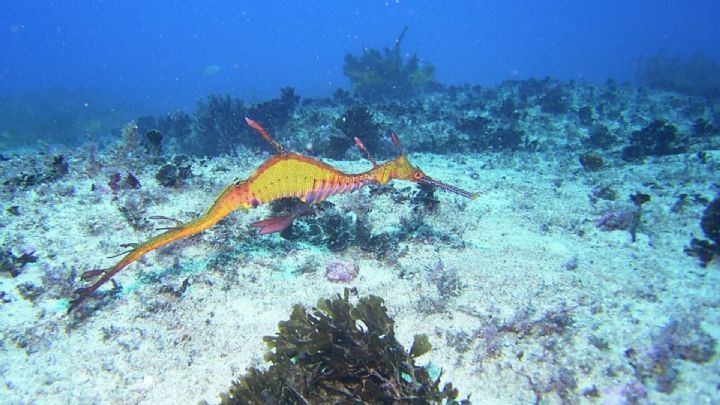 On the sand at the 12 to 15 metres level, in the area up to 3 or 4 metres from the rocks, you should see beautiful common sea dragons, but you must look carefully for they can easily be mistaken for pieces of kelp. In the late winter and early spring period look close and you may even see an egg laden male. Take care climbing down the narrow track for this dive, and when you reach the bottom be VERY CAREFUL not to slip on the blackish slime on the rock shelf, especially if wet. If you do not take care YOU WILL SLIP OVER! This site is done as a drift dive, although we have heard of certain dive stores getting customers out at the same spot, it can be very tricky so not the preffered method. Swimming directly out from the entry, you will drop down to around 22 metres. You will find a number of bommies here and if you look carefully you may even spot the occasional seahorse or two. Swimming further, the depth will decrease to around 10-12 metres. For the most part, exiting at the steps is the easiest. We prefer to get the gear together, pull on the wetsuit or drysuit and then move the vehicle down to the steps carpark rather than climbing all the way up then having to walk up the road with full gear on. An exceptional dive site that can only be dived in really calm seas. It is a great dive location, with a great underwater landform together with a huge array of sponge gardens and heaps of fish. As the name says, the Mystery Dive will be decided on the day and most likely somewhere either we have never been or rarely go. For something alittle different come and join us on a Mystery Dive. The dive site off of Bondi Beach is located at the beachs northern end. When PRO DIVE comes to this site we access it from the boat rather than going to it as a shore dive, which is an option too. Diving this site from the boat is highly preferable because one does not have to deal with the hassle of finding parking in Bondi. You will descend along the anchor line down to a depth of approximately 15 metres where a large reef is located. There are many overhangs and caves here that act as shelter for the abundance of marine life that can be found here. 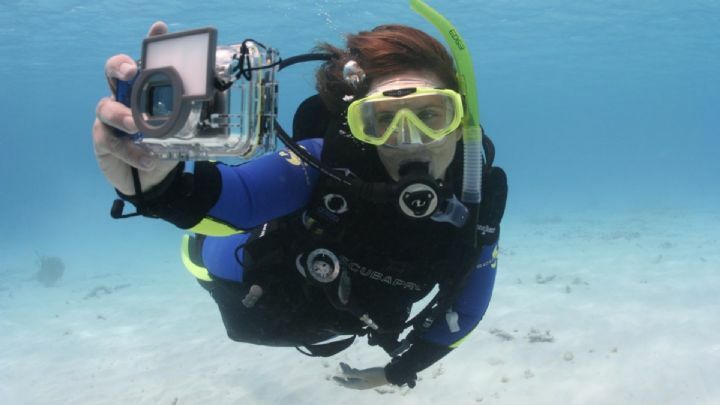 Adventurous divers have the option of going through several different swim-throughs as well. Wobbegongs, giant cuttlefish, green morays, ladder-finned pomfrets, bullseyes, yellowtail, red morwong, one spot puller, old wives, blue gropers, nannygai, crayfish, morrish idols, rays, and maori and king wrasses all can be found here routinely. Nudibranch enthusiasts will also be pleased to know that many different species are around as well. Located on the North side of Clovelly Bay is shark point, one of the best Shore Dive Sites in Sydney. We rate this site as Black, due to the tricky entrance and exit points divers must cope with off of the rocks. When you go, be sure to go with another diver or guide who has been there before and knows what they are doing. Enter the water from the point and then drop underneath the waves until you reach a depth of approximately 8 metres. The ocean floor drops-off to 13 metres after a brief swim and it is covered in huge boulders where many fish are hiding in nooks and crannies. As you continue south-east you will reach the rock-sand line at around 25 metres. Here there are rocks with lots of sponges and ascidians flourishing on them. In this area you can also expect to see wobbegongs, cuttlefish, bulleyes, roughies, and even blue devilfish. If you go a bit deeper you may encounter pygmy pipehorses but you will need a sharp eye to spot them. This is a dynamic and exciting shore dive, that will merit many visits if you wish to see all it has to offer. Definitely worth a visit! If you go to dive Shiprock you need to make sure that you schedule your dive for the hour surrounding high tide. This is when conditions are best because the water here can have quite strong tidal currents. To access this site you need to walk down a steep path that begins at the end of Shiprock road. The site is easily recognized by a large rock protruding out of the water that resembles a ship. This is where the site gets its name. Enter the water from a boat ramp and you can drop down to a depth of 2-3 metres. Swim east and the bottom slopes down to 6 metres and then you will come upon a wall that goes all the way down to 15 metres. Drop over the wall and head south until you reach a small bubble cave embedded in the wall. Opposite the wall are many large rocks that are covered in marine growth that attracts all sorts of fish. 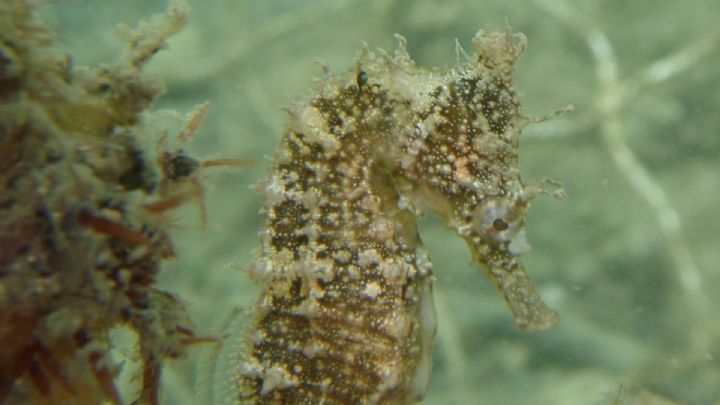 Sea horses and large schools of leatherjackets of all kinds can be found here. There are also three bommies that are located in this area. The largest of the three has a moray eel inhabiting it. Anglerfish, red indianfish and blue swimmer crabs can be seen here too. Back along the wall there are many overhangs that are home to estuary catfish, cuttlefish, decorator crabs, moray and conger eels, pipefish and the rare pineapplefish.